It is just when you hear the words that “this is not a war on the wealthy” that you can expect exactly that. During the Clinton years they put a cap on the wages of corporate executives. Only the first million dollars would be deductible. Did this cap apply to athletes or movie stars? The irony was that to avoid the consequences of the limit, stock options became popular and after the boom of the 1990’s many of the wealthy became much more wealthy as a result of the attempt to make them less so. I heard Ralph Nader on the radio criticizing Apple computer and other corporations for sitting on so much cash. If we forced them to dividend their cash it would be a stimulus that would make everybody wealthier. So it is not the profligate waste of government, 99 weeks of unemployment and wasted delayed stimulus of the government that has us mired. It is the greedy corporations sitting on their ill gotten cash from all those iPhones and iPads that poor consumers were duped into buying. 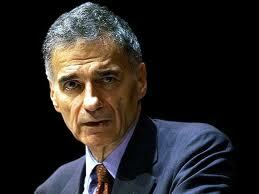 What product has Ralph Nader ever invented that we want? What innovation has he ever offered that any consumer would pay for? What company has he ever managed? What recession has he ever had to face with the demand of thousands of employees, shareholders and customers to consider? What fool would heed financial management advice from such inexperienced arrogance? Why is the fortune of Al Gore made from his increasingly unfounded climate theories not suspect, yet the fortunes made by those who provide products we actually want and need criticized as greedy gains? How can Hollywood celebrities who make millions criticize those in the financial sector who do the same? Where do they think the capital came from to make and distribute the movies that made them rich? This war on the wealthy, from the lips of Paul Krugman, Elizabeth Warren, Michael Moore and all the rest is a distraction from the failure of their dream candidate. The ‘Blame Bush’ song is getting stale, so they sought another scapegoat; anything rather than the failure of their own actions and ideas. The Occupy Wall Street crowd is boring ignorant theatre. 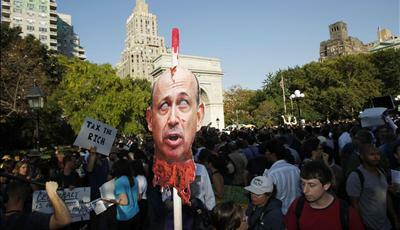 This picture of Goldman CEO Lloyd Blankfein at the OCW rally is incredibly violent and offensive. 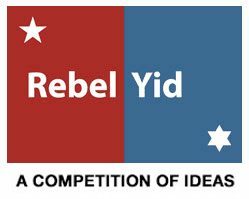 If this was seen at a Tea Party rally it would have been proof that the Tea Party was anti-Semitic, vilifying a Jew in the tradition of the worst European tradition. Where is the media call for civility? These protesters and their supporters are not against all wealthy people; just those who make more money than them or make it in an industry other than their own or one that they approve of. It is hard to take them seriously and I imagine that few outside of the media hucksters do.